Tripp Lite has recently issued their updated special pricing for P782-010-DH Tripp Lite 10ft HDMI DVI USB KVM Cable Kit USB A/B Keyboard Video Mouse 10′ for Federal Agency customers. This temporary special pricing expires on December 31 2018. For more product information, visit the landing page of any of the suppliers below. To place a government purchase on GSA or NASA SEWP contract vehicles, please visit any of the Government Contractor suppliers listed below. As always, feel free to contact us regarding product information or search a listing of products in our Product Review category. This Tripp Lite (Tripp Lite) P782-010-DH Tripp Lite 10ft HDMI DVI USB KVM Cable Kit USB A/B Keyboard Video Mouse 10′ listing reflects the special pricing for federal government customers including Defense Contract Audit Agency, Veteran Affairs, Veterans Affairs Department (VA), Veterans Benefits Administration (VBA), Veterans Day National Committee, Veterans Health Administration (VHA), Veterans’ Employment and Training Service (VETS), Vietnam Education Foundation, Voice of America (VOA), US Army, Army Corps of Engineers, Navy, Air Force, Marine Corps, etc. 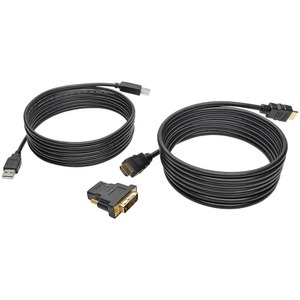 HDMI/DVI/USB KVM Cable Kit, 10 ft.
1 x USB cable (A/B M/M), 10 ft.
1 x HDMI cable (M/M), 10 ft.